When I recently spoke to Bob Corritore he had played a gig the night before at The Rhythm Room (his club) in Phoenix with Chris James & Patrick Rynn , was preparing to do his Blues radio show of 27 years, ‘Those Lowdown Blues’, on Public Radio Station KJZZ, and planning his busy week to come, which included doing some studio work with everything else on his plate. Bob is considered one of the best traditional blues harmonica players on the scene today, as well as producer, writer and winner of the coveted and highly prestigious KBA (Keeping the Blues Alive) award,as well as winning Blues Music Awards, and Blues Blast Awards. Bob has been nominated this year for two BMA’s, Historical Recording, and Harmonica Player. Blues Blast: Do you ever sleep ? I ask because when one looks at your legacy of work one has to wonder when do you get the beauty sleep that you obviously get ? Bob Corritore: I wake up each morning excited by what the day might bring. I have been very blessed with lots to do. But when you look at the things I do you are actually looking at what a team of people are doing. I have a great support system around me: Mona Watkins who is the Rhythm Room GM, and all her staff, Randy Chortkoff and all the folks at Delta Groove, my webmaster George Vaught, My social media coordinator Amy Brat, Dale Baich of Blue Witch Records, Clarke Rigsby of Tempest Recorders, John Wrobble of Porcupine Productions, Dave Shirk at Sonorous Mastering, my volunteers (Tony Tingle, Linda Marlowe, Tracey Thomas and Brandi Carter), all the great musicians I work with, and all the great friends, fans, festivals, promoters, publicists, writers, photographers, and many other people in many other support roles. Quite a great team! BB: Now I have to admit if we were to ask 100 or so people (Blues fans) to name hub cities for the Blues – Phoenix might not turn up. But with all work you have been doing there and the migration history of artists to the area that might change. Chico Chism is a prime example, he was there some 20 plus years – tell me a bit about how that came about and how he became the club drummer with the Rhythm Room All-Stars? BC: I moved from Chicago to Phoenix in 1981 and I was surprised to learn of all of Phoenix’s blues history. Louis Jordan lived in Phoenix during the 1950s. Ray Sharpe recorded his biggest hit “Linda Lu” in Phoenix in 1959. Dyke & The Blazers were a Phoenix based soul band that wrote and recorded the first version of “Funky Broadway” which refers to the Broadway Street in Phoenix, where they used to play frequently. Blues / jazz B3 organ wizard Jimmy Smith spent his last years as a Phoenix resident. I recently got together with Phoenix music historian John “Johnny D” Dixon and we put together an anthology CD called Flyin’ High; A Collection of Phoenix Blues, Rhythm, and Spirit from the 1950’s and 60’s. It includes 27 amazing songs by artists you likely have never heard of. Some thrilling blues sounds that come out of Phoenix. So to answer the second part of your question, let’s fast forward to 1986 and you have the great Chico Chism moving to Phoenix. Chico was Howlin’ Wolf’s last drummer and he was a great singer and a charismatic showman. Chico was filled with humor and personality, and he described himself as “Chico Chism, I’m the woman’s pet and the men’s threat, the house-rocker and the show stopper. I’m Chico the boogie man!” I met Chico in 1975 when I went to see Wolf on the West Side of Chicago at the 1815 Club. Chico came up and introduced himself to me during the break, and we were immediate friends. So I kept in touch with Chico after I moved to Phoenix. We started having phone conversations about him coming out to do some gigs. I had a few months of work lined up and Chico came out to Phoenix in the summer of 1986. As soon as he arrived, Chico was immediately loved by everyone in Phoenix, and he loved Phoenix back. Chico rose quickly to great popularity. We worked many, many gigs together. It was a great pleasure to have that Chicago beat in Phoenix. When I opened up the Rhythm Room in 1991, I put together the Rhythm Room All-Stars as a kickin’ house band that could back up the many guests artists that we would bring to Phoenix. Chico was the front-man of this group but we also played backup for so many great artists that would come to town: Jimmy Rogers, Bo Diddley, John Brim, Big Jack Johnson, Henry Gray, Louisiana Red, Lil’ Ed, R.L. Burnside, Jessie Mae Hemphill, Nappy Brown, Luther Tucker, Smokey Wilson, Pinetop Perkins, and so many others. Not only did the Rhythm Room All-Stars support the live shows but we participated in many recording sessions with many of these great artists. Chico and I always had a blast and we collaborated on so many projects. After his stroke in 2002 Chico’s health began to decline and playing ability was limited, but he still came out regularly and played as best he could until his passing on January 28th, 2007. He was my close friend and musical partner, and he left an indelible mark on Phoenix. Chico was recently inducted in Arizona Musicians and Entertainer’s Hall Of Fame. The Rhythm Room All-Stars have gone on in the Chico Chism tradition with a current lineup that includes Chris James, Patrick Rynn, Brian Fahey, and myself. BB: Why did you originally come out to Phoenix, goodness, some thirty years ago? What were the deciding factors to stay here? BC: I originally came to Phoenix with the idea that I would only stay for about a year. My younger brother John had settled in the Phoenix suburb of Scottsdale after he graduated from ASU, and I liked the idea of a warm Arizona winter. I was in love with the Chicago blues scene that I had left, so I had every intention of returning. Within a month or so of being gone, I get a call from Louisiana Red, who at the time was living in Chicago. We had worked together at the Delta Fish Market on the West Side and had exchanged phone numbers. Red had called and got my forwarding number and when I told him I had moved to Phoenix, he said he had been wanting to come out to Arizona and that he knew a blues singer named Eunice Davis who was also living here . I suggested that we should get some gigs together if he did come visit, and a few weeks later Red shows up! Note that at that time in Red’s life, he was quite the roaming bluesman, traveling from town to town looking for a place to play and belong. So for about a week or so, Red stayed with Eunice until that did not work out, and the next thing I knew I had Louisiana Red as my room-mate! Red stayed with me and my then girlfriend Anne Columna for the next year. We scuffled for gigs and played around the house everyday together. We became like family. Red is such a brilliant blues player and I looked back at the blessing it was to have had that time with him. Red would leave Arizona for a European tour where would meet Dora, his loving wife of almost 30 years. Red and I still are very close friends and we find ways to play together each year. He will be playing at the Rhythm Room on June 3 and 4 coming up. FYI in 1982, Red and I used to play quite a bit at this club called the Purple Turtle. This club would later became the Rhythm Room! So it is very symbolic for Red to come back and play at his old digs! My girlfriend and I had developed our relationship around looking out for Red, and so ironically, after Red left, our common cause was gone and we soon broke up! So after Red left, I worked with a few bands including Tommy Dukes, a great Mississippi born, Arizona raised bluesman. I soon landed a 2 year gig in Big Pete Pearson’s band. In 1983 my parents moved to Phoenix and so my whole family was here. In 1984 I started my radio show on KJZZ which is now 27 years running! I would work in various bands around Phoenix including one of Janiva Magness’ early bands, and with Chief Schabuttie Gilliame, Buddy Reed and others. In 1986 Chico Chism moved to Phoenix where he spent the last 20 years of his life. In 1991 I opened the Rhythm Room , and I started regularly taking visiting traditional blues artists into the studio. I currently have a wealth of unreleased masters which I hope to release sometime in my life. In 1999 I released my first CD, Bob Corritore / All-Star Blues Sessions. It was on the HighTone label which was famous for all those influential Robert Cray records. Though I had produced a number of prior releases, and had my harmonica included a few locally distributed releases, this was the first as a recording artist and it was on a prestigious label. That CD put my name on the map as a harmonica player. In 2004, I met Dave Riley at the King Biscuit Blues Festival, which has led to a long and fruitful collaboration. Dave now is a winter resident of Phoenix and has a place 5 minutes away from my place in Scottsdale. Anyway, Phoenix has been good for me and I have carved out a nice life for myself here. BB: With regard to the Rhythm Room, it is still going strong, since 1991 – congratulations – with the economy still somewhat shaky and Blues clubs closing down, how do you manage to do it? BC: The blues club business is a tricky one. The Rhythm Room has been very lucky to have much support from the community. We look at our-self as a music venue with a primary focus on the blues. While the weekends are strictly blues and soul, we invite concerts of all genres to make up our weekdays. It is a great sounding, great feeling, live music room with no TVs, dart boards, or pool tables. We are a concert club venue with no apologies. Also my wonderful GM, Mona Watkins does an amazing job of keeping a great team of employees together. In September of this year the Rhythm Room will celebrate our 20 year anniversary with a 3 day blues extravaganza on September 16, 17 and 18! BB: If I can just touch on your radio show for a moment. I have 2 releases from your KJZZ 91.5 FM in Phoenix, these are just great. They feature such artists as Lazy Lester, Lowell Fulson, Henry Gray and current hot property Jerry Lawson. These are a priceless aural portrait of a wonderful time in Blues music, it’s like a history lesson. How great has it been doing this broadcast ? Did you ever think it would run this long? BC: Hosting my blues radio program is a weekly pleasure for me. I get to sit back and play my favorite music for thousands of listeners. KJZZ has valued and celebrated my radio program and provided me with this outlet for over 27 years. The CDs you speak of commemorate the 20 and 25 year anniversaries of the program. I had all these recordings archived from radio guest appearances on my show. As you can see I have had some amazing guests over the years. In addition to artists you mention I have had Robert Lockwood, Jr., Harmonica Fats, Johnny Dyer, Rick Estrin, Cedel Davis, Harmonica Fats, Dave Riley, Billy Flynn, Charlie Musselwhite, Lil’ Ed, Otis Clay, Johnny Rawls, Willie Dixon, and many others. And by the way Jerry Lawson lives in Phoenix and is also my neighbor! Jerry is the famous former lead singer of the Persuasions and his new A Capella project is making quite a splash these days on national TV! So over the years, I have had lots of great broadcasts. Your readers can tune in on-line each Sunday from 6pm to 11pm, Mountain Standard Time at www.KJZZ.org. BB: What would be your assessment of the Blues currently and what does the future look like for it’s continued viability and growth? BC: If you go to the IBCs or the BMAs in Memphis you know that the blues is a healthy, living, growing thing. As it has always done throughout history, the blues will adapt to its surroundings and reflect the new world it now exists in. Since the blues is a multi-generational movement and the elders are the respected teachers and the inspiration for those that came after, it is hard to see all the passings. We are blessed to still have artists like Pinetop Perkins, and Honeyboy Edwards who are both in their 90s. They are a window into the past. I recently had a heart to heart conversation with Barrelhouse Chuck who reminded me how privileged we were to know many of the great Chicago bluesmen who formed the music, and we need to hold up their memory and the lessons that they taught us. I agree that those entrusted with these sacred lessons from the blues elders have the responsibility to keep that music alive. I have seen some promising young blues players on the scene: Marquise Knox, Vincent Bury, Matt Hill, Cleome Bova, of course Cedric Burnside and Lightnin’ Malcolm, Gina Sicilia, Dave Gross, Kilborn Alley, Zoe Savage (from Joe Filisko’s harmonica class), Valerie June, Steve Marriner, and Bharath Rajakumar to name a few. The blues will live on. BB: In December 2010, you produced (and played on) ‘Oil Spill Blues’ with Dave Riley for ‘Blues for the Gulf’ for the VizzTone label Group. On it there are some outstanding musicians and all the proceeds goes to the Voice Of The Wetlands charity fund, which is great. How did you get involved with that project? BC: Just to clarify, the Blues For The Gulf CD was produced by a group of concerned individuals around that terrible environmental disaster. Dave Riley and I just donated a song that we wrote for the project, and we hope that it will do a little something for the cause. We became aware of this project from Honey Sepeda and Bob Margolin and immediately wanted to contribute. BB: But you have a long legacy of producing Blues artists such as Louisiana Red, Tomcat Courtney, to local artists like Chief Schabuttie Gilliame and Dave Riley. I would guess you feel right at home on either side of the studio? What is it that you bring to the studio as a producer that makes you so requested? BC: Many of the projects that you refer to are ones that I have initiated, so I do not know if requested fits into all the producer situations. But recently I was asked to produce some nice sessions, with the latest being Mud Morganfield, the eldest son of Muddy Waters! We just recorded Mud’s record in February in Chicago (Brrr!). I have always loved and respected the recording process and I look at it as an art form in and of itself. If you add to that, the historic importance of the blues, then you have a powerful motive to create a lasting legacy of recordings. I do need to mention my long partnership with recording wizard Clarke Rigsby who has been with me in most of my endeavors. Because of Clarke’s skill we have created a consistent track record of some really great sounding releases. So when Amanda Taylor called me to put together a live recording and filming of last year’s great harmonica event “Amanda’s Roller Coaster”, she is signing up this great system that Clarke and I have put together and have tested many times. That same thing happened when my friend Kid Ramos called me to help put together Floyd Dixon’s final recording session which we did live at the Rhythm Room. I am very lucky to have all these great experiences with many of my favorite blues artists. BB: What are you up to these days ? I know you have been working with Jessi Colter, does working in another genre (Country) provide any special challenges or opportunities to you as a harp player? BC: I am in the middle of a number of exiting recording projects right now: Dave Riley and I are busy working on our third CD together. I mentioned earlier the Mud Morganfield CD that is in the works. I have produced about half of Diunna Greenleaf’s forthcoming CD, with Diunna, Anson Funderburgh, and others producing the remainder of the record. I will be putting together a 20 year anniversary CD of live performances over the years from the Rhythm Room. I play harmonica on 4 or 5 tracks on the forthcoming CD by Louisiana Red (with Little Victor’s Juke Joint) which will be out this year on Ruf Records. I recently wrote the liner notes for a new Lazy Lester CD for the Bluestown label in Norway. I have upcoming shows this year in Chicago, Brazil, the Netherlands, Belgium, Switzerland, Canada, Takoma, Washington, Simi Valley, California and more! It will be a great year of gigs. Dave Riley and I will bring our band to the Moulin Ospel Blues Festival in the Netherlands in May (I will leave for the festival from Memphis the day after the BMAs). We have nice week of European touring after that planned. I am excited to return to Brazil for a tour with Dave Riley. I just found out that I will be bringing the Rhythm Room All-Stars with Tail Dragger, Henry Gray, and Kirk Fletcher to the 2011 Lucerne Blues Festival in Switzerland. That is one hard hitting group of blues players! I will playing the Edmonton Labatts Blues fest with Dave Riley one day and the Delta Groove Harp Blast Revue the next. I am excited to play at the Simi Valley Cajun and Blues Festival as a guest of the Mannish Boys and backing my friend and harp mentor Johnny Dyer. I will playing the Chicago Blues Festival with Mud Morganfield. Dave and I will play the Gray Sky Blues Festival in Takoma, Washington coming up. Speaking of Jessi Colter, we work a few gigs together each year. We have been doing this for about 8 years now and she has become a close friend. I met her when she stopped into the Rhythm Room shortly after Waylon died. It is really an honor to make music with her. It’s a whole other bag then I normally play but I love the gentle ballads and the country romps she does. We both meet in the middle stylistically and somehow it works! She has such a sweet spirit to her music. She lives in a very high profile, celebrity prone world, and it is fun to visit that world, which is quite a contrast to the blues life that I normally lead. For example, earlier this year I did a gig with Tail Dragger where we played 2 nights of unapologetic, raw, down home blues, and the very next weekend I am at a posh charity dinner performing “I’m Not Lisa” with Jessi Colter to an audience that included former Vice President Dan Quayle, Jane Seymour and other high profile people. The contrast was unbelievable. I will always be a blues musician through and through, but it is nice occasionally have my blues upbringing interface with another style of music, especially when it’s with Jessi Colter! BB: You also have a new release with Louisiana Red due out soon? I saw you with Red and Little Victor at last years’ BMA’s what a dynamic show. BC: That was a fun show with Louisiana Red at the BMAs. Red has such a rich blues sound, and we have such a long history together that there is a natural thing that happens when we play. Little Victor has a similar chemistry with Red, and you put all that together with the great band that Victor organized and you have a real groove. It was great to be up there with Red and stand next to him at his moment of glory. The next day we did a Blues Foundation event at Alfred’s on Beale Street, then right after gig we went directly to Leeway Recording studio where we started 2 non-stop days of recording. At each of these stops we played full throttle, intense blues which is the only way Red likes to play. By the end of those two days in the studio we had given our all and were completely wiped out. But we captured a passionate, validated Louisiana Red at a special moment in time. I’m am really looking forward to the release of this CD later this year. It will be powerful! BB: Bob, thanks for taking the time to do this interview with us, and let’s hope people realize a bit more about what you do for the Blues family and music that we all love. 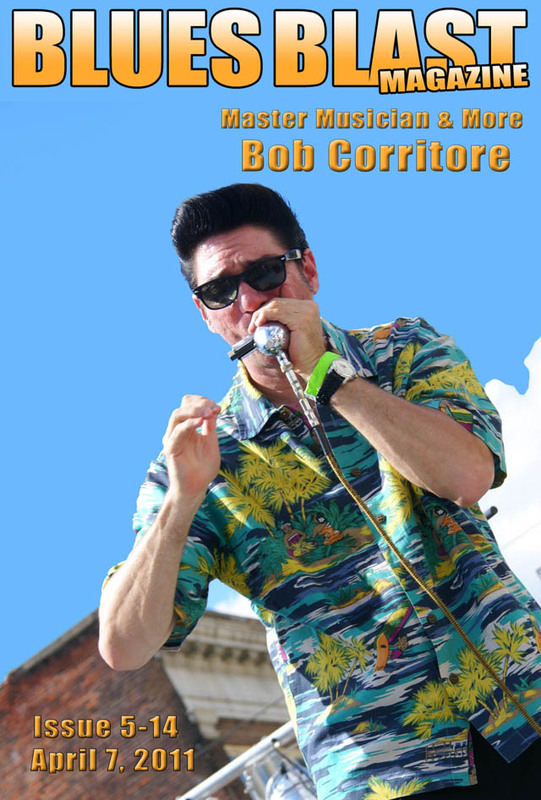 You can find out more about Mr. Corritore at his web site, http://www.bobcorritore.com/ including his many releases and his remarkable history in the Blues. Interviewer Chefjimi Patricola is a classically trained chef, blues loving writer and creative master of Blues411.com. He can also can be found on FaceBook and at festivals and clubs in your neighborhood and town.